Live a long healthy life in Gadangme. This is symbolized by the Adinkra symbol, Aya--perseverance. First you need a sense of home. Feeling close to, and being valued by other people makes you well. This starts from home--the place where the people you love are. You need to rest and enjoy nature. You are part of nature, so being able to feel in harmony with nature improves health. Then you need to learn something new from a book. Learning new things makes you grow. Growth is healthy. Then you need some play. Laugh at a joke. Have fun with your friends and family. Finally, you need to help others who appreciate your work. They will show gratitude, which makes you feel useful and wanted. Then you will always be well and healthy to explore this wonderful universe. 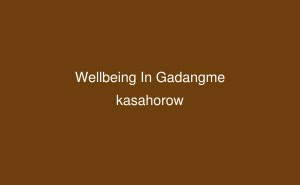 Now let's learn a few more Gadangme words about health and wellbeing!